Sir George Somers: A man and his Times. Book by Bermudian the late David Raine. The portrait (right) was painted by Paul van Somer (no relation) originally from the Netherlands, believed to be during the lifetime of the Admiral. The original oil painting canvas -in much greater detail than shown above - measures 45 x 35 inches, in wood and gilded 54.5 by 43.25 inch frame. It and its twin - of wife Lady Somers - were purchased in 1932 (some say 1937) by the Bermuda Historical Monuments Trust and Bermuda Historical Society (BHS) from Miss E. Winifred Bellamy, of Woodside Cottage, Plymouth, Devon, England, a descendant of Sir George. Both paintings had been handed down from generation to generation in England through a collateral branch of the Somers family. Also in the Museum of the BHS at Par la Ville, 13 Queen Street, Hamilton is the wooden sea chest belonging to Sir George. It is of early 17th century Italian origin. The chest is thought to be Venetian and has a scene from Greek mythology showing Artemis, Goddess of the Hunt, surprised by Acteon, a hunter, while bathing. To punish him she turns him into a stag, whereupon his own dogs attack and kill him, no longer recognizing him as their master. The Bellamy family, direct descendants of the Admiral, also sold Sir George's lode stone. This was used to magnetize his compass needles during his earlier seafaring voyages. The lode stone is thought to date back to 1600. Egg-shaped and banded by strips of iron, it is mounted on an oak plinth with a plaque which states 'Lodestone, Sir George Summer, obit 1610'. 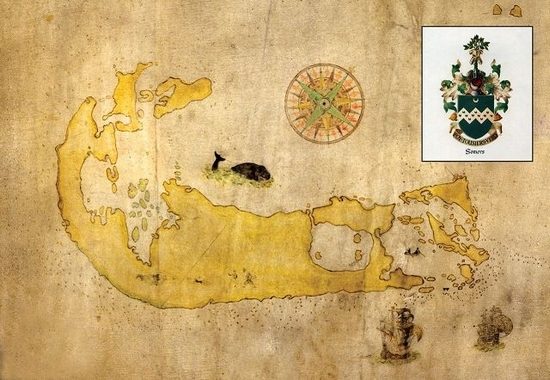 Also on display at the BHS Museum is a freehand sketch of the 1609 Somer's Map, a hand-painted reproduction of the original map of Bermuda charted by Sir George. 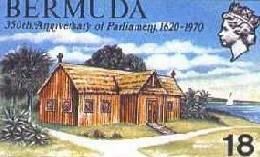 The original map is in the Bermuda Archives. The existence of these valuable artifacts was first made known to Bermudians by Major-General and two times Governor of Bermuda and historian Sir John Henry Lefroy. In the 1882 edition of the manuscript in the Sloane Collection, British Museum he edited, he added an original and unpublished portrait of Admiral Sir George Somers which Miss Bellamy inherited from her ancestor, Dr. Bellamy, MD, connected with the Somers family. Lefroy reproduced the painting on page 11 of his book "Historye of the Bermudaes or Summer Islands." Lefroy was also the author of "Memorials Of the Discovery and Early Settlement of the Bermudas or Somers Islands." It was first published in MDCCCLXXXII by the Hakluyt Society in a limited edition. No. LXV is today in the collection of the Bermuda Historical Society. On pages 49 to 52, the lives of Sir George and Lady Somers are described by historian Preston Davie in the book Virginia Historical Portraiture, 556 pages. It was first published in 1929 in a Limited Edition of One Thousand Copies, of which the Bermuda Historical Society has Copy No. 369. Englishman Admiral Sir George Somers, was born in 1554 in Lyme Regis, Dorset, England, in a house on Broad Street. Lyme Regis was an-already historic town in Dorset, England. 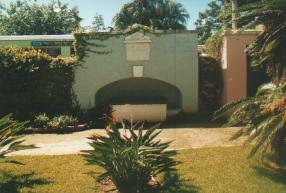 It was also, because of Somers, from where Bermuda's History began. He was one of the sons, the fourth of five, of John Somers a merchant and farm owner, of Berne Farm, situated between the Marshwood Vale village of Whitchurch Canonicorum and the main road at Charmouth. Berne Farm was the long-established Somers family home. Walter Raleigh, two years George’s senior, was a neighbor and boyhood friend. As Lyme Regis was conveniently situated for trade with France and Spain, complete with a unique artificial breakwater called The Cobb to shelter local shipping, Somers apparently went to sea as a boy in the early 1560s and soon became a competent mariner. He seems to have spent his early maritime career trading rather than raiding, since his name does not appear in contemporary privateering accounts. In 1582, Somers’s career prospects improved hugely after his marriage, at the age of 28, to Joan Heywood, then just 19. She brought ownership of three houses in Lyme Regis into the marriage as her dowry. Rental income and his continued commercial success enabled the couple to buy Berne Manor, a 200-acre estate near Whitchurch Canonicorum, and Orchard House, another 100-acre farm nearby, for the-then substantial sum of £600. In 1588, Somers coordinated Lyme Regis’s defenses as the enormous Spanish Armada approached England’s coast. He sent out three ships to join the epic sea battle that raged off the coast from his town and watched with relief as the English side prevailed. After 1588, he joined Sir Francis Drake’s unsuccessful invasion of Portugal in 1589 and took many prizes while cruising in Azorean waters. He used his share of the £8,000 in prize money to purchase Waybay House, a 1,000-acre manor near Weymouth. In 1590, after both his father and brother died, Somers became head of the family shipping business and the guardian of his two nephews, Nicholas and Matthew. In 1595, he first gained personal naval fame in an expedition in 1595 against the Spanish Main led by Sir Amyas Preston. 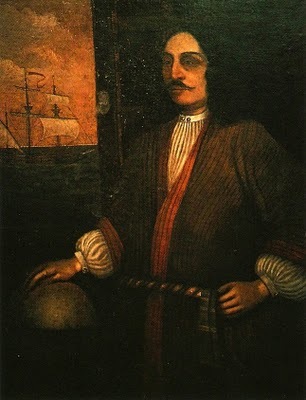 In 1595, he and Preston arranged a six-vessel privateer fleet that systematically pillaged much of the Spanish Caribbean. They raided Margarita Island’s pearl fishery and sacked Cumana, Caracas and Coche before a violent tempest, or hurricane, drove Somers off the Venezuela coast. He then called at Hispaniola (now the Dominican Republic and Haiti), Jamaica, the Cayman Islands and western Cuba before returning home via Newfoundland. The six-month expedition was financially disappointing in the slight plunder it yielded but provided Somers as an astute navigator with a wealth of information about America. In 1597, he was part of another privateer expedition to the Azores, when his ship nearly sank in a storm. It was then that Somers then shifted his service from privateering to the Royal Navy in 1600, commanding several of Her Majesty’s warships. His reputation as a successful privateer enabled him to join the Royal Navy as a relatively senior officer, a commander, entirely on his own merits. In 1600, he commanded HMS Vanguard which stopped and captured a Spanish treasure ship. In 1601, he captained HMS Swiftsure during the attack of the Spanish fleet off Kinsale, Ireland. In 1602, he commanded HMS Warspite in two cruises to the Azores, during which he earned appreciable prize monies. Earlier a neighbor and a friend of Sir Walter Raleigh, he also became a contemporary and periodic naval associate of the latter (but did not upset Queen Elizabeth 1 like Raleigh did). In 1603, Somers left his seafaring life and plunged into civic affairs. He was knighted the day before the coronation of Scottish James I of England and 6 of England, but it is believed this was due more for his sizeable estates than for his privateering and naval service to England. He was elected a Member of Parliament seven months later and became mayor of Lyme Regis in 1604. In 1604, the poet T. Winter wrote a poet's praise to Sir George, in lavish summary of his life to that time. 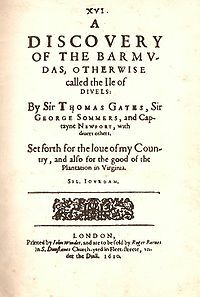 In 1606, Somers became a charter member of a new Virginia Company. Like Walter Raleigh, his anti-Spanish views and privateering exploits had denied the Spanish many of their colonial ambitions and exploitation by the English of America and beyond suited his own ambitions. Within a year, it had dispatched colonists to Jamestown. However, Somers was not very active personally in the Virginia Company before 1609. He had become much more committed to domestic politics and business, dividing his time between London, Lyme Regis and his Berne Manor household. He and Joan had been unable to have children, but are believed to have raised their nephews Nicholas and Matthew as if they were their own. Somers was then a mature businessman and Member of Parliament in his fifties. His landed estates and continued overseas trading provided him with ample income. So it was a surprise to many when he traded his business activities, domesticity and marital security to become, in 1609, Admiral of the Virginia Company's nine vessel Third Supply Relief Fleet that sailed from London, then Plymouth, bound for Virginia in 1609, to re-provision and bring fresh colonists to that first ever English Colony in the New World. It was at that time the largest, most expensive and most ambitious colonial expedition by any nation, financed privately by London based merchants and noblemen united in a common cause for profit for themselves and their nation. They intended to colonize the New World for Britain in competition with Spain, France and the Netherlands. They wanted to give Britons a fresh start in virgin lands, to relieve overcrowding in Britain's cities; and to be seen as the men who engineered such initiatives. This was the general way colonization was handled then. Somers, an adventurer and risk-taker at heart, was in his mid 50s and saw in the opportunity a chance to stake his own unique claim to fame. Jamestown, Virginia, earlier settled in 1607 by friend Raleigh, but in constant danger from colonists who sickened and died or were killed by Indians and who had found no gold, just endured miseries, intrigued him. Somers was determined to thwart Spain in its protests at and constant threats to destroy the infant colony. In the spring of 1609, the Virginia Company assembled a massive fleet with 500 settlers to put Jamestown on a more secure footing. Although England and Spain were technically at peace, there was a 50-50 chance Spanish privateers could attack this fleet en route. A combined former privateer himself and naval commander who possessed both courage and daring, was called for, to oversee other leaders such as Christopher Newport. In all respects, Somers stood out and in view of its importance to Britain, he was made an Admiral specifically to give him every authority he needed. Only Governor-elect Sir Thomas Gates outranked him - and only after they landed successfully. 1609. In May, James I issued the second charter to the Virginia Company. Sir Thomas Smith (Smythe) was appointed Treasurer of the Virginia Company. 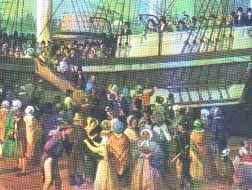 On June 2, not long after her launch, the Virginia Company's ship "Sea Venture" sailed on its maiden voyage from Plymouth, England, bound for Jamestown, Virginia. 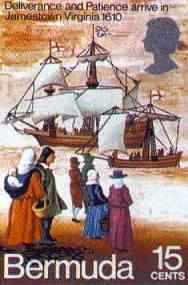 She was newly built in 1609 in Aldeburgh, Suffolk, England, and was England's first purpose-designed emigrant ship. She displaced 300 tons, cost £1,500, and differed from her contemporaries primarily in her internal arrangements. Her guns were placed on her main deck, rather than below decks as was then the norm. This meant the ship did not need double-timbering, and she may have been the first single-timbered, armed merchant ship built in England. Her hold was sheathed and furnished for passengers. She was armed with eight nine-pounder demi-culverins, eight five-pounder sakers (cannon), four three-pounder falcons (also cannon), and four arquebuses. Her uncompleted journey to Jamestown appears to have been her maiden voyage. Admiral Somers was on overall command of the "Third Supply" Relief Fleet of nine vessels. The newly appointed then-deputy Governor-elect of Virginia, Sir Thomas Gates, was the most senior passenger in order of precedence. Captain Christopher Newport was chief officer of the fleet. George Yeardley was then commander of land forces under Gates. 600 colonists included John Rolfe and his pregnant first wife, who died later in Bermuda. The fleet was to relieve the struggling British colony established in 1607 under Captain John Smith after failure of the Roanoke Island venture of Sir Walter Raleigh. It was then the largest and most expensive colonization ever undertaken by Britain. For many days, all went well. The fleet sailed in consort until 24 July, when it encountered a hurricane off the Azores. The vessels were scattered by the storm, carried for days by the raging winds, but all except the Sea Venture managed to reach the James River in Virginia and later Jamestown. Seven of the nine vessels of the Third Supply Relief Fleet eventually reached Virginia in August 1609. The others were the Diamond, Blessing, Falcon, Unitie, Lion and Swallow. They were all battered by the same tempest and forced to jettison much needed cargo. The Catch was the only one to perish at sea, with the loss of all souls. Hundreds of miles from her scheduled course, all the passengers sea sick and miserable. Aboard the Sea Venture, drifting, almost power-less except for a solitary sail, listing heavily and about to sink, Admiral Somers made his fateful but heroic command decision. Within clear sight of what were then the dreaded Island of Devils, to avoid loss of life and five the passengers and crew a reasonable chance of survival ashore compared to certain death by drowning by not doing so, he deliberately personally steered the ship firmly onto a visible Bermuda reef, on 29 July. It was daring seamanship. It was soon discovered the ship was, in fact, lodged between two reefs, which prevented it from sinking. (It was almost directly opposite a point that later became known later, appropriately, as Discovery Bay). This allowed not only the hundred and fifty men, women and children to get ashore on to the Island of St George's, but later all the crew and for most of the cargo and much of the ship itself to be salvaged. It was a miracle there was no loss of life. Richard Frobisher, an experienced shipwright, began building a pinnace out of the Sea Venture timbers to carry the survivors on to Virginia. Sir George Somers, recognizing that this vessel would not be large enough to take them all, recommended a second pinnace, this time not from the wrecked ship's timbers but of as yet untried Bermuda cedar for the remainder. Sir George supervised the building of the 30 ton pinnace Patience while the 80 ton barque Deliverance was under the supervision of Sir Thomas Gates, both from spars from the and rigging of the wrecked "Sea Venture" and local cedar. 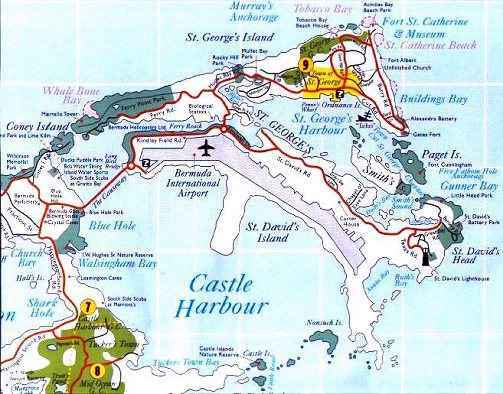 Ever an adventurous sailor, Sir George was the first man to explore and map Bermuda. For many months until the vessels being built were completed, he, a mapping assistant and a boatman, sometimes several of the latter, in small but seaworthy boats they built themselves at least in part from Bermuda cedar, went out to sea to chart both the main island and other islands. 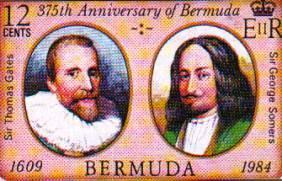 Admiral Sir George Somers, Governor Elect Sir Thomas Gates and their companions including John Rolfe, all presumed dead by those in Virginia, remained in Bermuda for 10 months. Their first Christmas was much warmer than in England or Virginia. William Strachey, their scribe, kept a diary and also recorded how the colonists, to give thanks for their safe arrival and also to provide a place for worship built the first (wooden) St. Peter's Church in St. George's (see postage stamp on left, below) from palmetto and cedar and thatched it with palmetto; and attached the bell of the wrecked Sea Venture. The two vessels being built by the crew and volunteers among the passengers from the original Sea Venture were completed nearly 10 months later, in April 1610 - the larger being called the Deliverance whilst the other was called the Patience. 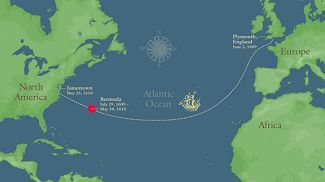 The two vessels, both commanded by the Admiral, sailed for Virginia on 10 May and reached Jamestown 10 days later on 24 May with their 142 Bermuda castaways, after 42 weeks in Bermuda. The arrival of the Deliverance and Patience in 1610 was Virginia's first Thanksgiving (before the later New England version). It was because of the arrival of Sir George, Sir Thomas Gates, Captain Christopher Newport and almost all colonists and crew originally on the Sea Venture feared lost in the tempest - and the food they brought. The safe arrival in Jamestown, after deliverance from the tempest which had wrecked the Sea Venture and caused the long stay in Bermuda of its passengers and crew, were the chief elements of the saga that inspired William Shakespeare - when the news sent by William Stachey and others reached London - that he wrote The Tempest. (Unfortunately for Virginia and Bermuda, he used poetic license place the work on an Italian island, instead of retaining geographical and historical accuracy). 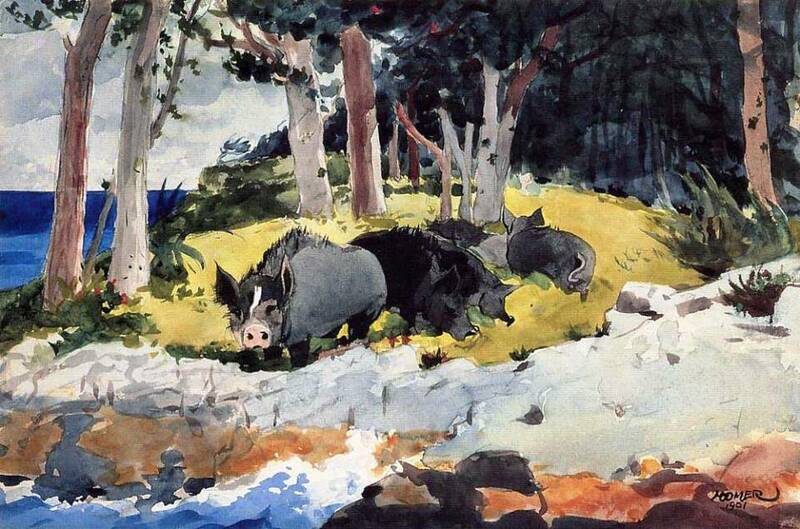 Food on the two Bermuda built ships included wild hogs found on Bermuda (see below). They had been left there by much earlier sailors before they sailed away again - or put overboard nearby by passing ships, to swim ashore, breed and become a ready supply of food in case of emergency. (They were the first pigs found in the New World by English speaking colonists. They reached America from Bermuda. Their importance in Bermuda was such that a rendering of one of them was featured later on Bermuda's Hog Money, the earliest Colonial coinage in the English speaking New World). But they found the Jamestown colonists in great distress, with only 60 survivors, provisions in very short supply at the settlement due in part to hostile acts of local Indians, a bad and bitter winter. The Virginia colony had suffered dreadfully from famine, disease, periodic attacks from hostile native Indians inability of colonists - many of them from English cities - to adapt to new rural conditions. Their food ran out. They had decided to abandon their colony. Fortunately, Sir George had provisioned his ships with enough food, including potatoes, to buy a very little time for the Jamestown Colony of Virginia, but it was not enough. (Humble potatoes, intended for planting in Virginia and first carried on the Sea Venture in 1609, intended to be grown by British colonists in the New World, occurred not in the USA but in Bermuda). 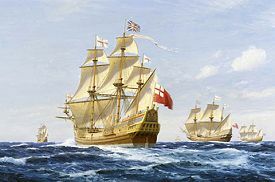 Fortunately for the departing colonists then exiting via the James River, they met incoming Lord de la Ware with three ships sufficiently well supplied for a month to relieve their distress and salvage the colony. Lord De La Ware had expected to find the Colony in good condition - not in need of food. (Nor did he and his staff expect to see that the very first shipment of white, red and sweet potatoes seen in Jamestown came from Bermuda. They were grown there by the castaways before they brought and sent them to Virginia). Also taken were the first onions, figs and olives, from stock grown first in Bermuda. From Virginia, they spread to Maryland and elsewhere. In fact, many more of the plants of Virginia and other early American colonies of England got there initially via Bermuda. Without the stock of fresh foods, potatoes and animals brought by Sir George and his companions from the Somers Isles that saved Virginia for about 2 weeks, Virginia would have been wiped out, starved to death. Even with the arrival of Lord De La Ware, the appointed Governor, with three supply ships, the starving did not improve. Thus, on June 19, 1610 in company with another pinnace (which was forced back) Sir George decided to sail once more for Bermuda in the Patience to collect mostly wild hogs and fish for Jamestown. Soon after arriving, Somers died on November 9, 1610, it is said from eating too much pork. He had made it clear he expected the crew to return to Jamestown with supplies irrespective of any eventuality but his nephew, Captain Matthew Somers who was captain of the Patience, disobeyed his uncle and took his preserved body to England in a cedar chest, minus his heart which at his request remained in Bermuda. It was only because of the latter that England knew for sure that not only had the vast majority of the colonists had been saved, not perished but that Bermuda, then initially known purely as the Isle of Devils, then after the Sea Venture's wreckage as Virgineola, in tribute to the late Virgin Queen Elizabeth, had, like Jamestown, considerable potential as a planned new colony, and with none of the bitter winter or hostile inhabitants of Jamestown. The Virginians never got the additional food promised them from Bermuda, but England got its first Bermuda built sea-going vessel, the sight of which aroused much curiosity in Lyme Regis when it arrived because of its construction so different to most English built ships. Her use of New World Bermuda cedar and the fact that the sailors aboard her duly reported how she was constructed in part from spars and rigging of the original wrecked "Sea Venture" - such a prominent ship in the Lyme Regis area from Sir George Somer's acquisition of her - made the "Patience" famous in Dorset and beyond. She never sailed back to the New World but continued in British coastal waters. For leadership, courage at sea and other skills Admiral Sir George Somers showed, the islands became the Somers Isles, still Bermuda's official alternate name. 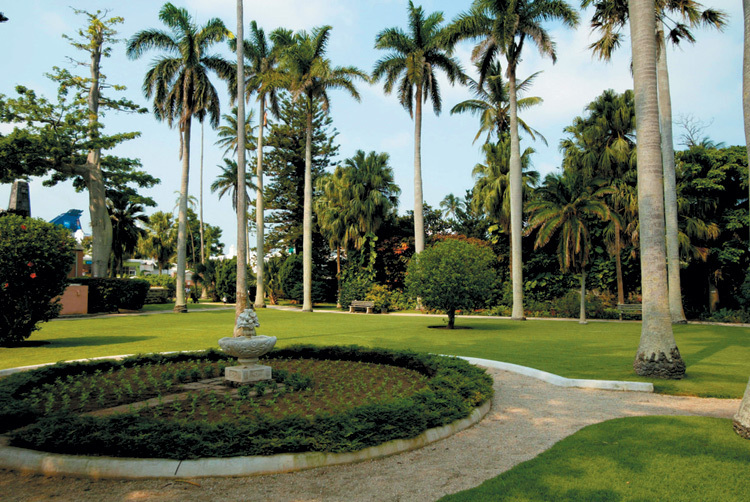 In those days, Bermuda had a considerable colonial importance. 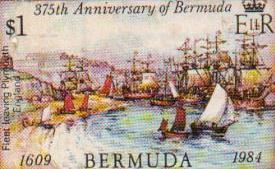 Bermuda Postage stamps of 1984 show Departure from Plymouth in 1609 and Admiral Sir George Somers (right), with Sir Thomas Gates. When Governor Butler found the neglected place where the heart and entrails had been buried in St. George's in 1610, he composed his own flowery tribute of his era which was engraved in marble. It is no longer extant but a record of it has been made. 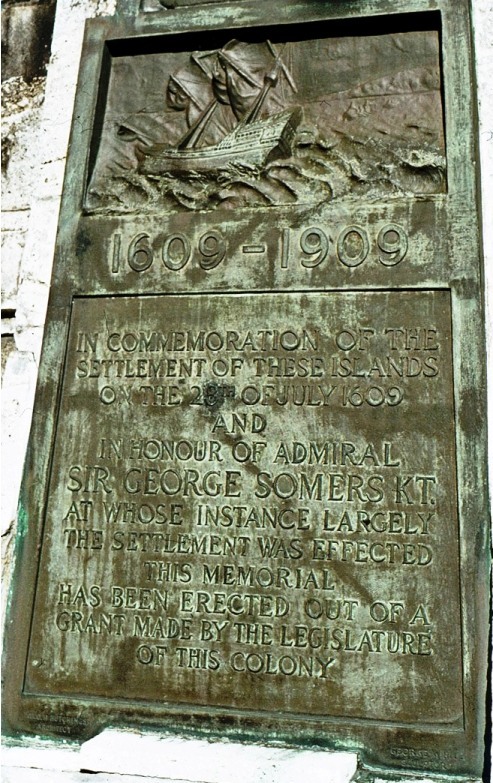 This famous Governor and great compiler of the earliest historical records of Bermuda, made sure a memorial tablet was erected in the Somers Garden, St. George's, with the following inscription: "Near this spot was interred in the year 1610 the heart of the heroic Admiral Sir George Somers who nobly sacrificed his life to carry succor to the infant and suffering Plantation now the State of Virginia. To preserve his fame to future ages, near the scene of his memorable shipwreck of 1609, the Governor and Commander in Chief of the Colony for the time being caused this tablet to be erected, 1876." These are pleasant public gardens in the town, mostly open space, more of a park. They were opened in 1920 to commemorate Sir George Somers by the Prince of Wales at the time (later the Duke of Windsor), during his first visit (voyage) to Bermuda. Albert Edward, Prince of Wales (later, briefly, King Edward VIII) was then a serving Royal Navy officer on the 1920 refitted Royal Navy battle cruiser Renown, on a tour of Bermuda, the Caribbean, the USA and Australia. HMS Renown, lead ship of a class of two 26,500-ton battle cruisers, was built at Glasgow, Scotland. Completed in September 1916, she served with the Grand Fleet in the North Sea during the remaining two years of World War I. She was at HM Dockyard Bermuda during the Royal Visit. The main feature of the gardens is a monument - the Somers Memorial, below - to Admiral Sir George Somers whose body was shipped to England but whose heart was buried here. In the Christmas season, the Gardens are lit, from 5 pm to 8:30 pm. with nest views of the light display from Shinbone Alley and the York Street side. the colonizer of the Bermuda Islands. died in Bermuda in November 1610.
is buried beneath the old chantry under the present vestry. On February 15, 1911, two years later than the actual tercentenary, a Memorial Monument to Sir George Somers - this Bermuda Tercentenary Plaque - was unveiled here in the Somer's Garden in St. George's, with the 1st Battalion of the Bedfordshire Regiment in attendance. It was placed near the site where Butler's Memorial once stood. This was erected on June 2 in Plymouth, Devon, England. 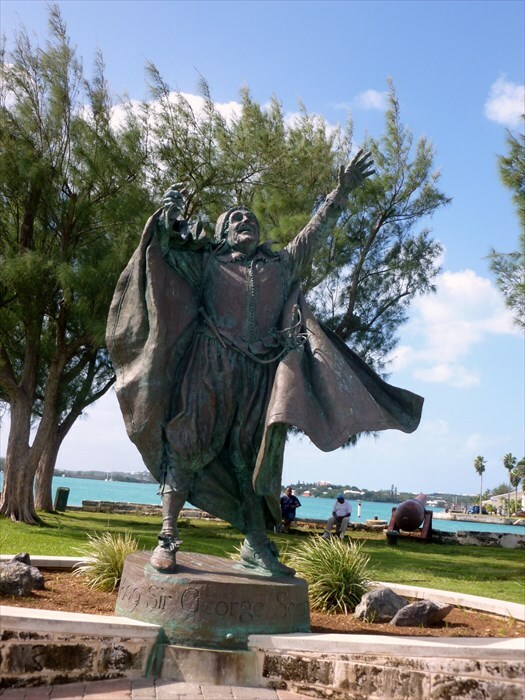 It was where the Admiral first started his Bermuda Adventure in 1609. It is not far from the Mayflower Plaque where the Pilgrims sailed to what is now Plymouth, Massachusetts, in 1620. On July 28, 2009 Bermuda celebrated its 400th anniversary with a recreation of the first moments of its settlement, a proud display of its diverse culture and a birthday message from the Queen. Hundreds of spectators gathered at St. Catherine's Beach in St. George's to watch a re-enactment of the survivors of the wrecked Sea Venture the ill-fated ship which brought the first English settlers to the Island exactly 400 years ago coming ashore. The 6.30 p.m. performance, which retold the historic story of how Admiral Sir George Somers and his compatriots first set foot here, was just one element in a day of festivities to mark Somers Day. The commemorations began with a time capsule ceremony outside St. George's Town Hall at 2.30 p.m., featuring entertainment from the School of Music Steel Pan Orchestra. Town crier David Frith welcomed dignitaries and representatives of numerous groups, who placed items - including books, DVDs, memorabilia, photographs, stamps, newspapers, magazines and coins - into a metal drum container. Next was a trip for VIPs and descendants of the Sea Venture survivors on-board the Spirit of Bermuda to the site of the 1609 wreck. The ceremony of thanksgiving began with the firing of a cannon from the deck of the Spirit sloop. Mr. Frith welcomed visitors and dignitaries, before Reverend David Raths gave a blessing. A fanfare by two trumpeters from the Bermuda Regiment Band gave the signal for flowers to be strewn over the site of the wreck. Mr. Frith then made a toast to the survivors of the Sea Venture and their descendants. The celebrations continued at a cocktail reception to mark the official opening of the World Heritage Centre by the St. George's Foundation. The facility uses state-of-the art technology, talks, tours, historical re-enactments and a programme of dramatic presentations, cultural activities and special events to tell Bermuda's 400-year history. Acting Premier Derrick Burgess congratulated the foundation on a "first-class job well done". Governor Sir Richard Gozney said: "Our warmest congratulations to everyone involved in helping to get this facility going. It is a wonderful facility and I hope people will appreciate just how wide its scope is." At 6 p.m., with the sun still blazing in the east end, the activities moved to the foot of Fort St. Catherine, where a large crowd of locals and visitors lined the sands to wait for history to be retold. Half an hour later, after performances from Somerset Brigade Band, North Village Band, Bermuda Islands Pipe Band, the Salvation Army Band and sailors from HMS Manchester, the moment all had been waiting for arrived. Two longboats flying the flag of St. George came into view around the curve of the fort, carrying actors dressed in 17th century costume. They rowed ashore to applause from the audience, which included Mr. Burgess and Sir Richard, as well as St. George's Mayor Mariea Caisey and Opposition leader Kim Swan. The "settlers" then held a religious service on the beach, originally named Gates Bay by the Sea Venture's Lieutenant-General Sir Thomas Gates, to "affirm their faith in the God who saved them from the sea". Actor Robbie Godfrey, in the role of Sir Thomas, declared to cheers from the crowd: "I claim these islands, in their entirety, to be English soil," before a cross was driven into the sand. The Sea Venture "survivors" led a procession to the centre of St. George, where the party continued in the town square, with music from the Bermuda Regiment Band and Corp of Drums. Sir Richard read out a personal message to Bermudians from Queen Elizabeth II a descendant, he pointed out, of the King of England, James I, at the time of the Sea Venture wreck. Her Majesty's greeting, sent to Conchita Ming, chairman of the Bermuda 400th anniversary committee, said: "I extend warm greetings to the people of Bermuda as you celebrate 400 years of settlement. "Bermuda's history is a testament to the resourcefulness and resilience of the people who call Bermuda home, characteristics shown by the early settlers and through the ages. I am proud of your achievements. The shipwreck of the Sea Venture in Bermuda in 1609, and the subsequent building of two ships to permit the Sea Venture's crew to join the rescue of the Jamestown colony in Virginia by its survivors, is one of the stories of the western world. Over the past four centuries Bermuda has evolved into a diverse multi-ethnic and multicultural community that is special and probably unique in world terms. I am confident that you will continue to thrive." Mr. Burgess had a simple message for the Island. "Happy birthday, Bermuda!" he told those gathered. "This is a significant milestone of epic proportions and an event like no other." The Acting Premier said 2009 was the perfect year to showcase Bermuda and her people to the world with a celebration of its diverse cultures and ethnic groups. The re-enactment of the wreck, he said, was an opportunity to educate all about the Island's past. Culture Minister Neletha Butterfield said it was important to pay tribute to those who found themselves washed onto Bermuda's shores in 1609 and those that followed them to the Island. She said Bermuda's people had shown bravery, resourcefulness and humanity in the face of slavery and that it was important to tell the "whole story" of the Island's past. Mr. Swan said that despite Bermuda's challenges over the centuries "our path as a people has always been toward a better future". He added: "We must continue to have faith in ourselves and our God." Ms Caisey said St. George Bermuda's original capital had seen many changes since the Island was settled in 1609 by Sir George Somers. "While his vision of Bermuda was unlike what we have today, it was a welcome from the storm," she said. "Even with our existing challenges, Bermuda is still our safe haven and, for those of us who call Bermuda home, the most beautiful place on earth." Those giving speeches were joined on the stage in the square by guests from St. George's twin town, Lyme Regis, and from Jamestown, the Sea Venture's original destination. After a ceremonial cutting of a 400th birthday cake, the festivities carried on late into the evening, with music from the Tony Bari Trio; dancing from St. David's Native Community, Bermuda African Dance Co., Grupo Folklorico Vasco da Gama, Filipino dancers and several Gombey troupes; a fashion display and fireworks. The layout of the Parish named after Admiral Sir George Somers and his patron saint St. George of England. It includes the Town of St. George. Major General John Henry Lefroy: Memorials of the Discovery and Early Settlement of The Bermudas or Somers Isles, 1515–1685, . P.M. Wright. : The Sea Venture Story. Royal Historical Society: Shippes of the Reign of James 1st. F. Van Wyck Mason, Bermuda resident and novelist, The Sea Venture, first published in 1962. Scott O'Dell. 20th-century American author, account of the Sea Venture shipwreck, The Serpent Never Sleeps. Clyde Robert Bulla, children's author, account of the Sea Venture voyage, A Lion to Guard Us, about three children sailing to Jamestown to find their father.